It was a very hot day at the zoo and this wolf wasn’t interested in doing anything to energetic! Cleo & Buster have come into my life to fill the empty space left by My Beauty, My Mouse. They have been rescued to fill all our hearts with love and joy! Buster is dark brown with a fluffy tail. He spent the first 18 months of his 3 1/2 yrs in and out of a shelter for being an inquisitive kitten, so he is quite shy and cautious. Cleo is a playful 6 yr old, with long light beige hair. Both are Tabbies with that special M on their foreheads! Buster & Cleo’s older cat companion died in May and their human died suddenly in June then they spent the next few months in a vet clinic! 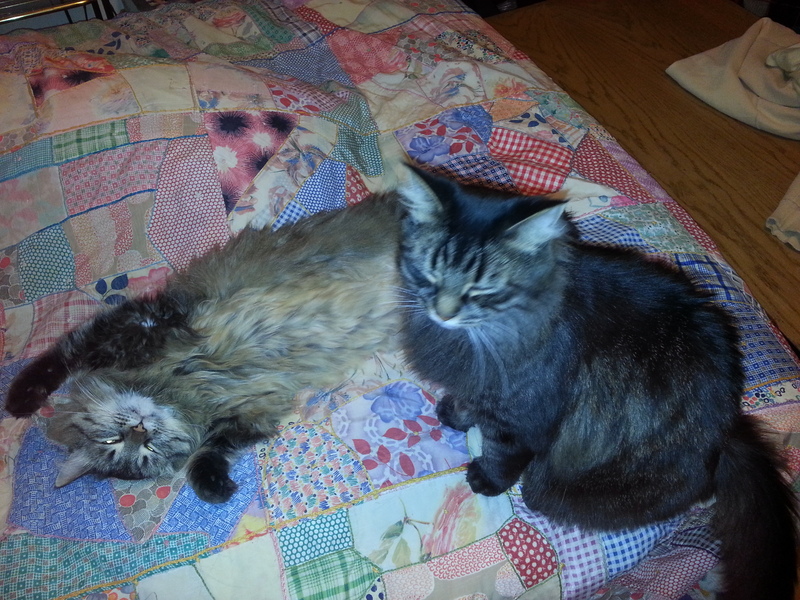 We are adjusting very nicely, with cuddles, brushing, petting. It is wonderful how much love and joy cats can bring into ones life. And how expanding your heart can be to open to an animals love and presence. Truly one of the greatest gifts is an animals unconditional love!